We were privileged to have the award-winning choir from the University of Central Lancashire with us for the weekend of Pentecost. On the Sunday evening we were blessed with a wide variety of sacred music and there was something for all tastes. During the service the Rev BB spoke about the need for ‘joy’ in our worship and immediately the choir broke into a ‘flashmob’ style presentation of ‘Joyful joyful’. 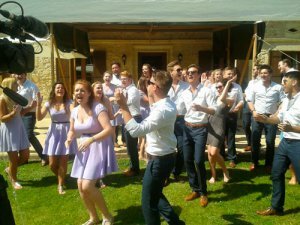 The congregation were clearly surprised for a moment or two but by the end of the song many of them had joined the choir ….dancing and singing. 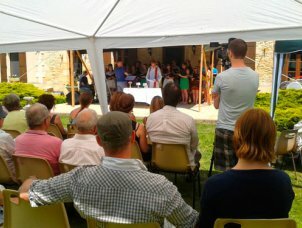 On the Monday we began a wonderful afternoon with an open-air Eucharist with around 110 present. The choir sang two reflective pieces and Ave Verum by Byrd. The service was hugely uplifting with a wonderful mixture of joy and solemnity. The Eucharist was followed by a picnic and it was great to see even more people arrive…. The choir sang the final concert of their tour with great gusto and the music ranged from Mozart’s Requiem to an arrangement of ‘Tequila Samba’ ! The applause did not stop for some minutes and the choir finished the day by another rendition of ‘Joyful joyful’ and many joined the choir again in singing, clapping and dancing. Our sincere thanks go to the choir, their conductor Mark Goggins, and to Chris and Deirdre Rankin for their wonderful hospitality!